Classroom environment is my favorite part of being a teacher. I love making my room look nice and neat. I get a sense of satisfaction in displaying the students' work on the wall. I just really like putting up bulletin boards. It is one of the main reasons I became a teacher (oh, and also inspiring tomorrow's leaders...;) ) So here is a post dedicated to all things bulletin boards. Raise your hand if you love T-pins! Anyone else besides me??? Until I went to my new school this year, I honestly didn't think anything of them. I have used them for as long as I can remember....everyone did. They were just part of the bulletin board culture. But when I went to the new school, and we had a walk through of all the classrooms, as everyone entered mine, the oohhs and ahhs over the "3D on the boards" was crazy! I hadn't really paid much attention to the "differentness" in the use of T-pins. Now, I appreciate them even more. In case you are unsure, T-pins look like little Ts. They just give the bulletin board a little bit of an oomph. For me, black just seems like the natural choice. Everything pops out on it. All colors seem more colorful. Work seems to stand out more. Plus, I can change my border color on a whim and not worry about changing the background paper! Don't throw tomatoes, but I don't like store bought borders. I think they are so flat. I also like double borders (white underneath a color) and lining up the wavy store bought ones is a pain the you know what. So I have decided to just make my own. I have done a lot of different things over the years, but my two favorite border incarnations are marble painted sentence strips and tissue paper. For the sentence strips, I get, well, sentence strips, and about 3 different colors of paint. I use white and then the dark and light tints of the main color. So for the ones I made this year, I used dark blue and turquoise, as well as white. I lay the strip out on newspaper, and take a bit of each color on my paintbrush. I then start dabbing the brush (not painting, dabbing) onto the strip. Sometimes I take more dark blue. Sometimes more white. I mix it up so that there are a lot of different colors to give it a marble effect. This takes me about 2 hours to make enough strips to cover the entire classroom. So there you have it. Just some of my own ideas about classroom environment and how I use the space in my room. Luckily, we don't have the strict fire marshal restrictions (yet) that I read about in other districts. If we did, I don't know what I would do! What is something you do in your classroom to make your bulletin boards stand out? Very cute! I used black on my student work board this year and I love the pop that colors get on it! I use black backgrounds on all on my boards. I bought yards of material a couple of years ago. The other boards are black wrapping paper. Cheap and doesn't fade. Thanks for the tips. Great post. Whoa you are super creative! :) Thanks for sharing your tips! My bulletin boards are black and it makes all the color pop-I love it! I remember oohing and aahing over your boards on PT over the years. I love that 3-dimensional look to them! I just switched to black fabric this year and I will switch to a different color. Every sign and student project displayed just stands out so nicely and I don't have to back everything on construction paper. I used ribbon for the borders this year too and they look really vibrant (it's just turquoise ribbon). 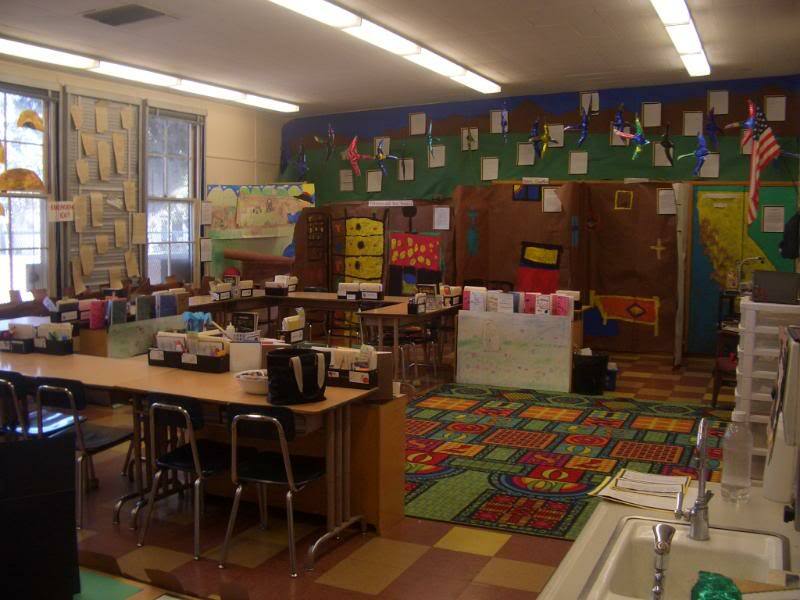 Thanks for sharing Steph, I love looking at your classroom photos! You have some really wonderful ideas, but for many students (and colleagues) your room is probably visually overwhelming. It is very important to have some blank space, especially if you want the students to focus on you. As an occupational therapist, most of my students would be too busy looking at everything in order to pay attention to anything else. I worked with a teacher who had alphabets at each seat, on several posters on each wall and on the carpet. There was also a lot of "stuff" hanging from the ceiling. The teacher said that it was her belief was "more is better." In her case, I would definitely say, "More is only more--not better." My student in her room was a very bright boy, but he wasn't making academic progress. He told me, "I just can't stop looking!" We had to move him to a less cluttered classroom, where he became more successful. Your BB's look great! I try to make mine interactive as much as possible and have kids to up to them for different activities. Wow! Love your bulletin boards. I'm a huge fan of black, too. One of my colleagues thought I was morbid when she saw me putting up my background paper. Then she saw how much the work "pops" and changed her mind. 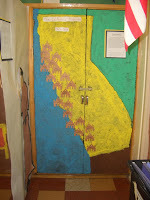 Any advice on the best adhesive to use to attach murals to closet doors? LOVE looking at your blog - I too share a HUGE passion for social studies. I am so impressed with the variety of ways you are able to connect it with other content (specifically ELA since those are the two subjects I teach). I would LOVE to hear more about your projects in other periods (explorers, etc.) Your room looks SO FUN! P.S. Do YOU staple the paper behind each student sheet for each thing you display? I've been struggling with time if I do it and "attractiveness" if the kids do it themselves ... tips? I LOVE black bulletin board paper! All of my boards have it because everything looks so much better! Your blog is awesome! I can't wait to find more great ideas as I find time to look through it! I've been teaching over 20 years, love my bulletin boards BUT, I have NEVER heard of T-pins! Really! Fun and helpful post! Thanks! I started with different colored paper my first year teaching (like the other teachers in my building), but I thought it didn't look as nice. My second year teaching I switched to black paper on all of my walls and added different colored bright bulletin boarders! My classroom looked so much brighter and I felt like it was more cohesive! I love black butcher paper!!! !